A new report says the D.C. U.S. Attorney’s office recently interviewed fired FBI Director James Comey, in what is being described as “an indication the office is seriously considering” whether former bureau Deputy Andrew McCabe should face criminal charges. 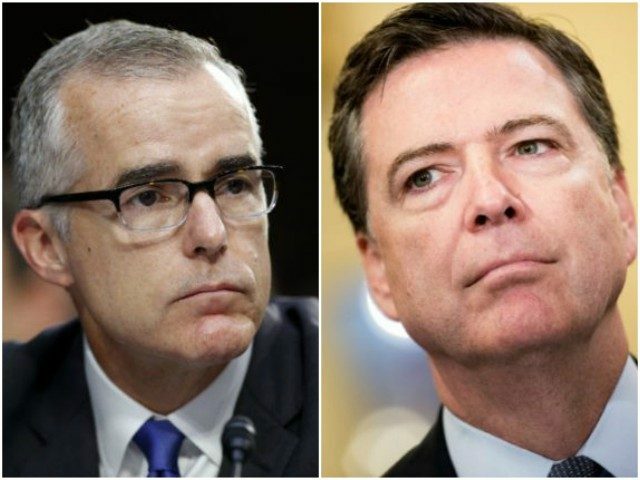 Justice Department Inspector General Michael E. Horowitz accused McCabe in April of misleading investigators and Comey four times — three of them under oath — about authorizing a disclosure to the media. Horowitz referred the findings to the D.C. U.S. Attorney’s Office to determine whether criminal charges are warranted. Lying to federal investigators can carry a five-year prison sentence, though McCabe disputes that he intentionally misled anyone. Comey’s interview, while significant, does not indicate prosecutors have reached any conclusions, and people familiar with the process said it is not surprising given the allegations McCabe faces. A referral from the inspector general does not guarantee charges will be filed. McCabe’s attorney, Michael Bromwich, issued a statement in response to what he describes as an “extremely disturbing” leak from the U.S. Attorney’s Office. Attorney General Jeff Sessions, acting on the recommendation of the FBI’s Office of Professional Responsibility, terminated McCabe on March 16. “The FBI’s OPR then reviewed the report and underlying documents and issued a disciplinary proposal recommending the dismissal of Mr. McCabe. Both the OIG and FBI OPR reports concluded that Mr. McCabe had made an unauthorized disclosure to the news media and lacked candor − including under oath − on multiple occasions,” Sessions said in a statement. In January, McCabe had reportedly stepped down as FBI Deputy Director and planned to remain on “leave” until spring, in order to be fully eligible for his pension.